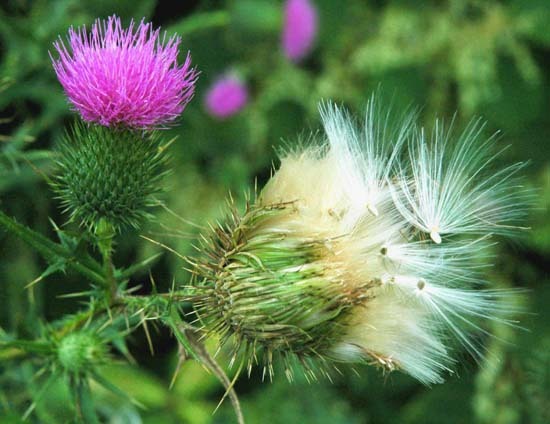 The Scottish thistle (Cirsium vulgare), the national flower of Scotland, is part of daisy family, and are generally found on waste ground and unmanaged pasture lands where seeds are able to germinate and establish without too much competition. Each flower can produce about 100 fruits, and each fruit comprises a seed attached to a 'parachute' of long hairs which is capable of carrying it over very long distances. Parachutes such as these are common in other members of the daisy family, such as the dandelion (Taraxacum officinale), but the parachutes of the Scottish thistle are much larger and have a distinctive secondary branching. Unlike manmade parachutes, these microscopic parachutes are mostly empty space, and hence, we would expect that the underlying fluid mechanics of these parachutes to be different than that of manmade parachutes. Indeed, previous attempts at a description of the parachute's flight capacity consider the drag due to Stokes flow around many slender hairs , and, in the case of the dandelion, this modelling approach gave good agreement with experiment. However, in other species of the daisy family (Tragopogon pratensis), modelling the pappus as a collection of slender bodies failed to capture the underlying fluid mechanics ; instead,  proposed that the parachute be treated as a porous surface. In this project, we aim to uncover the underlying fluid mechanics of the the Scottish thistle using computational fluid dynamics and physical modelling. The physical modelling will consist in vertical wind tunnel modelling to examine the structure of the wake behind the fruit as it falls. We will also perform particle image velocimetry to reveal the magnitude of the various flow fields in the wake. The CFD component will allow us to rapidly test the fruit's performances as control parameters such as the parachute's angle of attack or its porosity varies. Minami, S., Azuma, A., 2003. Various flying modes of wind-dispersal seeds. Journal of theoretical biology 225 (1), 1-14. Greene, D., Johnson, E., 1990. The aerodynamics of plumed seeds. Functional Ecology, 117-125.
dispersal. PloS one 10 (5), e0125040.